Creating a proposal is not very different from creating a work order. Start by navigating to the proposals module in the Front Office tab. On the Proposals screen, press Ctrl+N or right-click and select “New” from the menu to open the New Proposal window. All yellow fields are mandatory, while white fields are optional. Select a Job Type from the drop-down. More fields may appear asking for more information depending on the Service Type of the Job Type chosen. Select the appropriate Business Unit and Area. Choose when the proposed service dates will begin and end. Browse for the intended Customer on the proposal and for the relevant location using the […] (ellipsis) button to the right of the field. Add a summary of the planned Job. The description can be as short or as long as you need. Fill in any other optional fields as desired. (If there is not enough room to display all information fields, a “Details” tab will appear). Assign your first employee by clicking “Click here to add a new Employee” in the middle of the grid. You can search for employees by typing any part of their name into the box and selecting from the results, or by clicking the down arrow button and scrolling through the drop-down menu. View the Employee Details window by clicking the ellipsis button on the line next to their name. Add more lines for employees by clicking the green plus sign on the top-right corner of the Employees grid and repeating the search process. You can also add an entire work crew at once by clicking “Add Crew” in the bottom-right corner of the grid. Delete employee assignments by clicking the red X button below the “Add” icon. Choose a supervisor in the field above the Employees grid marked as “Supervisor”. The supervisor will be automatically listed in the Employees grid, if they are not already. Assign your first asset by clicking the “Click here to add a new Asset” text in the middle of the grid. You can search for an asset by typing any part of its name into the box and selecting from the results, or by clicking the down arrow button and scrolling through the drop-down menu. View the Asset Details window by clicking the ellipsis button on the line next to its name. 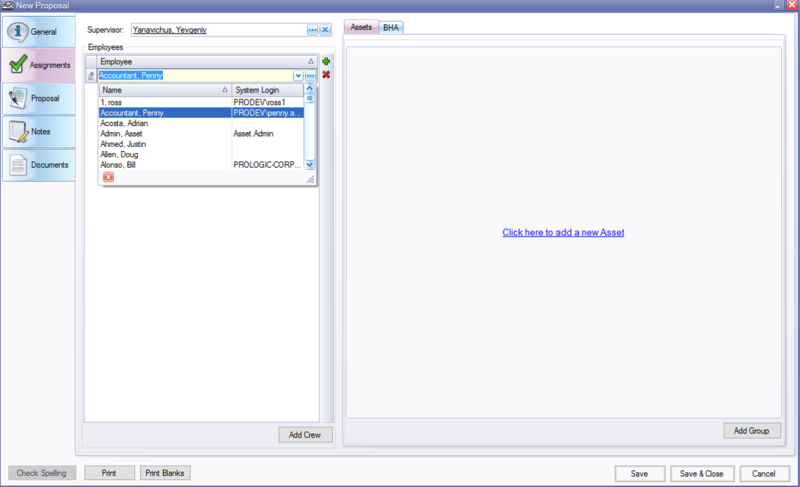 Optionally, choose an assigned employee to act as the asset operator for each asset. Add more lines for assets by clicking the green plus sign at the top-right corner of the Assets grid, and repeating the search process. You can also add an entire asset group at once by clicking “Add Group” in the bottom-right corner of the grid. Delete asset assignments by clicking the red X button below the “Add” icon. OFS Pro will alert users automatically if any of the employees or assets you try to assign are already scheduled for work during the same dates as your service order. Click the “Create Proposal” button in the lower-right of the screen. The application will automatically populate the proposal details with the Field Ticket Template information associated with the chosen Job Type. You can manage these items by adding and deleting item lines, adjusting quantities and setting individual price discounts. You can opt to set up three separate blanket discounts for the proposal. Depending on the service type, there may be an option to set a fixed price for the proposal. Fill in any other optional information desired, then click “Save & Close”.